I've been cooking a lot with bacon recently, or I should say, a lot more than usual. 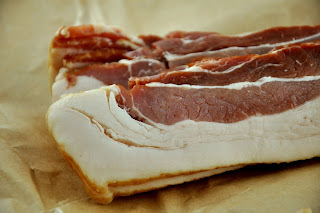 There will be recipes to follow in the next couple of weeks...but to get you ready for them, here are a couple of sustainable bacon recommendations for the NorCal folks who like their meat humanely raised. And of course, it's extra special tasty too. You'll be happy as a pig in mud! What Does “Sustainable” and “humanely raised” mean in this conext? It means the pigs were raised without the use of antibiotics and hormones, and that they're allowed to roam free rather than living their entire lives confined in a gestation crate. In the case of farms like Niman Ranch, it also extends to how the farmers treat the land the animals are raised on. From the awesome chefs at Zazu in Santa Rosa, CA, this bacon comes from heritage pigs raised in WA at Pure Country Pork farm, the first sustainable hog farm in the US. (I included a link so you could see the bizarre family photo with cut n' paste piggies.) The bacon from Black Pig Meat Co. is dry cured with brown sugar, a process that takes 21 days and leads to perfection. It's finished off with a nice long applewood smoking. Go get some! 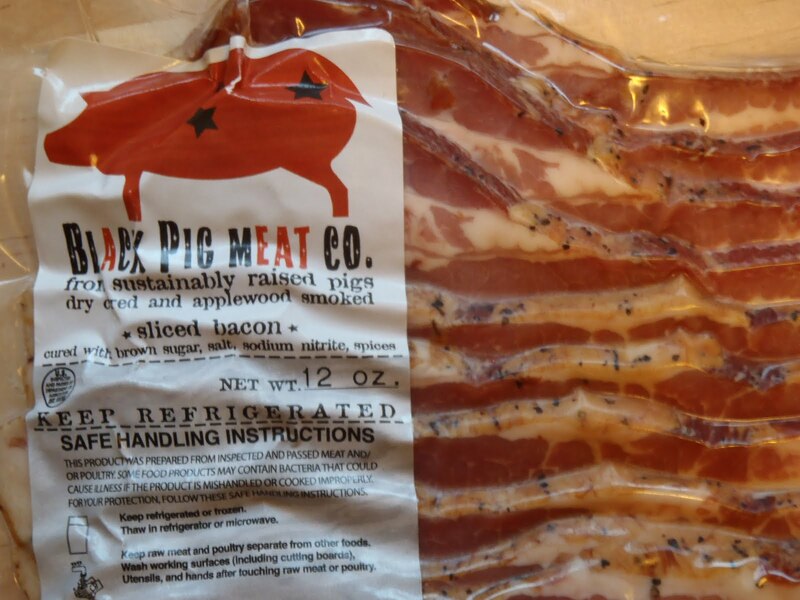 More readily available in the Bay Area and surrounding regions, this is pretty much my default bacon choice unless presented with something extra special like the one above. You can find maple and applewood smoked and bother are delicious. Go for the maple if you prefer and sweet and salty combo. Either way, you can't go wrong. Or...make your own bacon with a tasty slab 'o pork belly from Marin Sun Farms!